We move into the 8th month of the year 2014, looking back at a series of alarming human conflicts in the Middle East - all in the name of religion. A paradox of sorts, as no major religion that we know of, teaches its subjects to harm, maim or kill others. 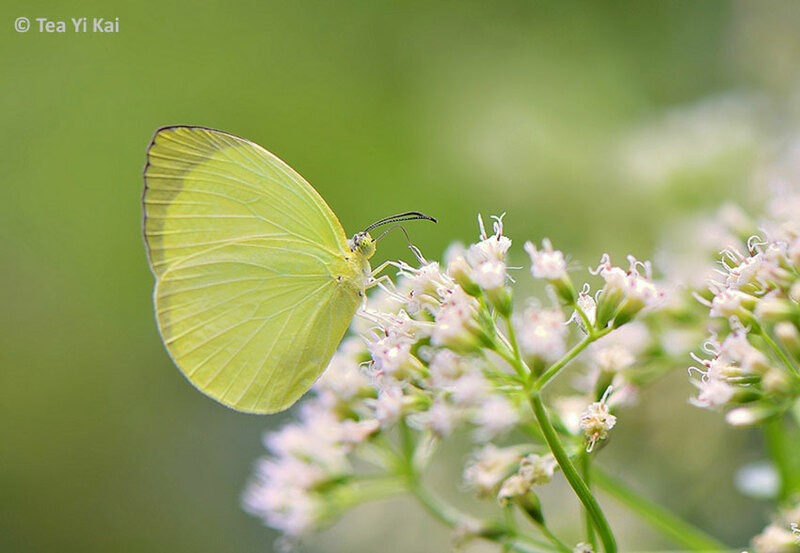 The atrocities that have been reported in the daily media only serves to reinforce the view that mankind is the weak link and can be manipulated to lose all sense of human-ness and reason. Further west to Africa, a deadly virus rears its ugly head again, as the Ebola Haemorrhagic Fever spreads across the African nations of Guinea, Sierra Leone and Liberia. First discovered back in 1976 in Zaire (now known as Republic of the Congo), Ebola has no known cure to date, and has a fatality rate of over 65%. On the 8th of this month, the World Health Organisation declared the epidemic to be an international public health emergency. We can only hope that the spread of the disease to other parts of the world can be effectively contained before it explodes into another SARS-like emergency. On 9 Aug this year, Singapore celebrated its 49th birthday since it became an independent city-state in 1965. It was a time for reflection on the progress of the nation from a struggling 3rd world Asian city to the successful metropolis that many other nations look on with admiration and envy. 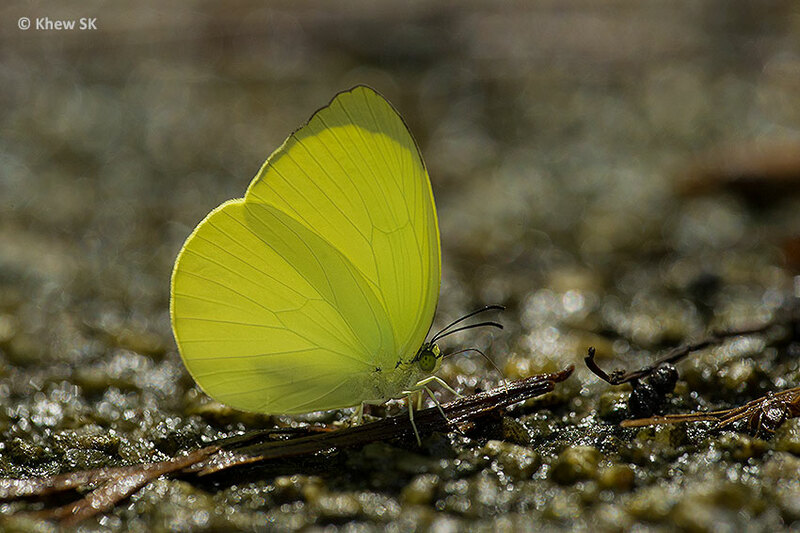 However, there is much angst amongst the locals these days, if comments on social media are to be taken seriously, as Singaporeans come to terms with the high cost of living and other daily struggles. I had the opportunity to travel to the UAE this month. 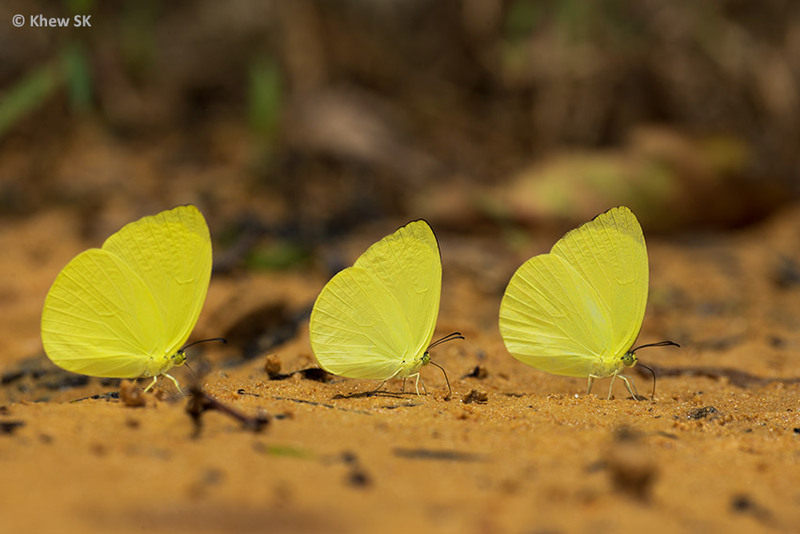 For many of us who travel abroad, it is always amazing to learn how well-regarded Singapore is. I was at the Dubai airport immigration, and had waited for the passenger in front of me (a Caucasian) to clear his immigration check. It took quite some time, as I saw him gesticulating angrily to the officer and looking displeased about the delay and being questioned. As he left in a huff, I quickly placed my passport on the counter with apprehension, and smiled at the officer, who appeared irritated at the previous passenger. He took a look at my passport, gestured to me to do the usual video check, and said "you're from Singapore?". I said yes, and he smiled at me, stamped my passport and said, "beautiful city!". I was out in about 30secs! August is certainly not the best month of the year to travel to Dubai and Abu Dhabi, where the daytime temperatures typically hit 40degC. But business calls, and off I went. My last trip to Dubai was some years back, and returning to this city in the sun again, I was no less impressed by the achievements and progress that followed after the global financial crisis. 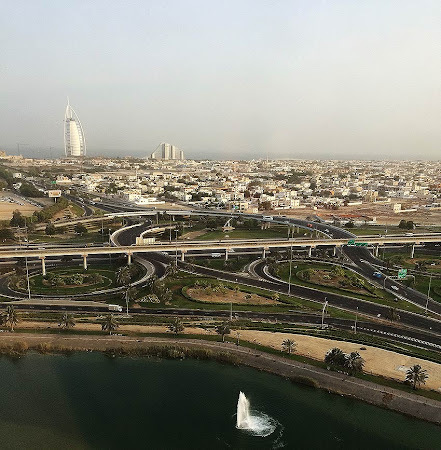 An hour's drive to Abu Dhabi, which I visited for the first time, also left a positive impression of the cleanliness and advancements of these two Middle Eastern cities. Five to seven lane highways (and that's in one direction!) were typical of their expressways, with new shiny luxury cars plying the well-built roads. However, looking around the harsh desert landscape made me miss the verdant equatorial greenery that we have in Singapore. Needless to say, I did not see a single butterfly throughout my entire trip, even though I'm sure they must be out there somewhere! 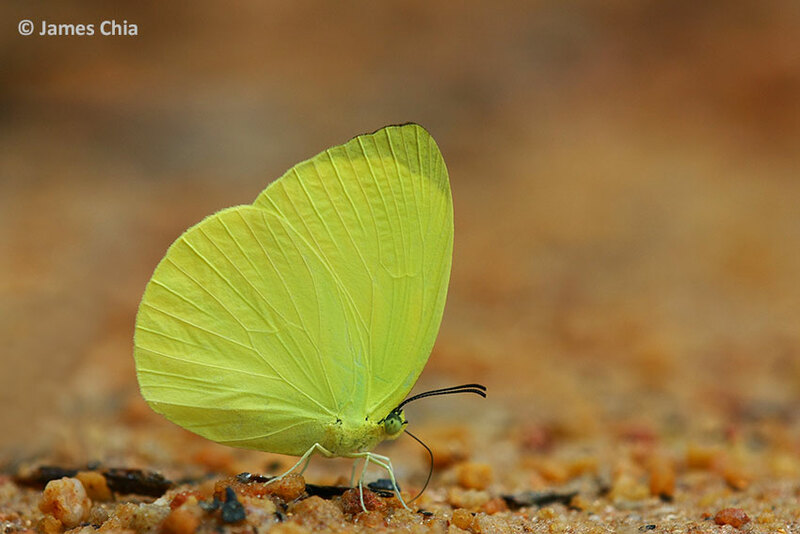 Coming back to our Butterfly of the Month, we feature a common and rather plain-looking butterfly, the Tree Yellow (Gandaca harina distanti). 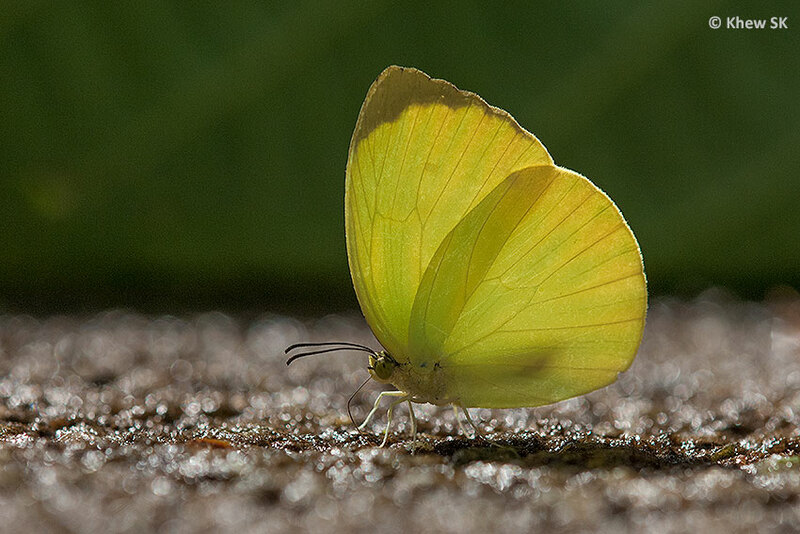 This small and predominantly yellow butterfly is a forest-specialist, and is usually found in Singapore's forested nature reserves and fringe areas surrounding the nature reserves. 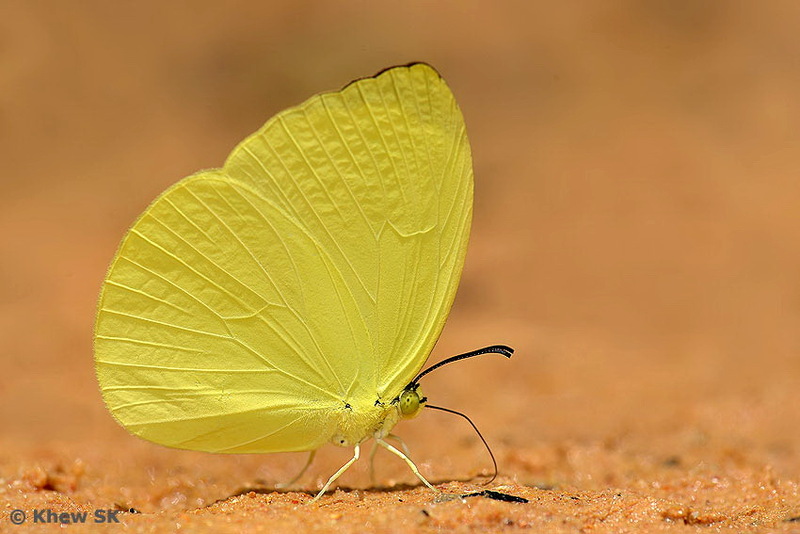 It is skittish, and is typically fluttering around restlessly as it moves in search for food. 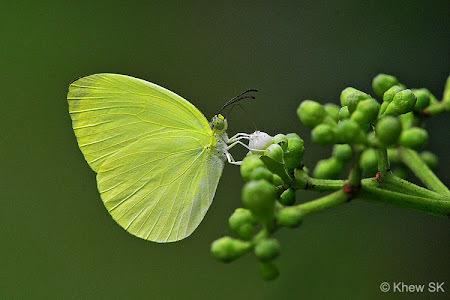 It is rarely seen outside the forested areas in Singapore. 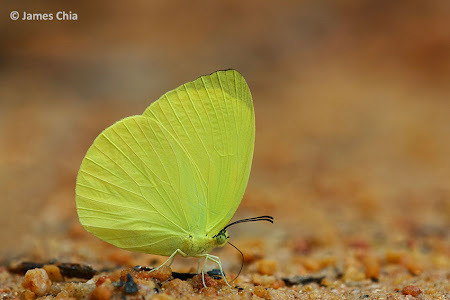 The Tree Yellow is common and is regularly observed feeding at flowering plants as well as puddling with other butterfly species at sandy streambanks and damp forest footpaths. 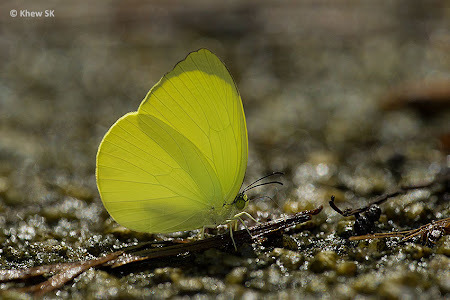 Contrary to the early authors' observations that mention that this species does not puddle, the Tree Yellow has been often encountered puddling - at times in numbers that exceed 6 individuals! 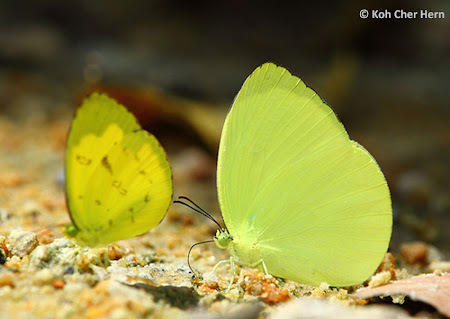 The Tree Yellow resembles the related Eurema species (Grass Yellows) and are often seen in the company of these other species. 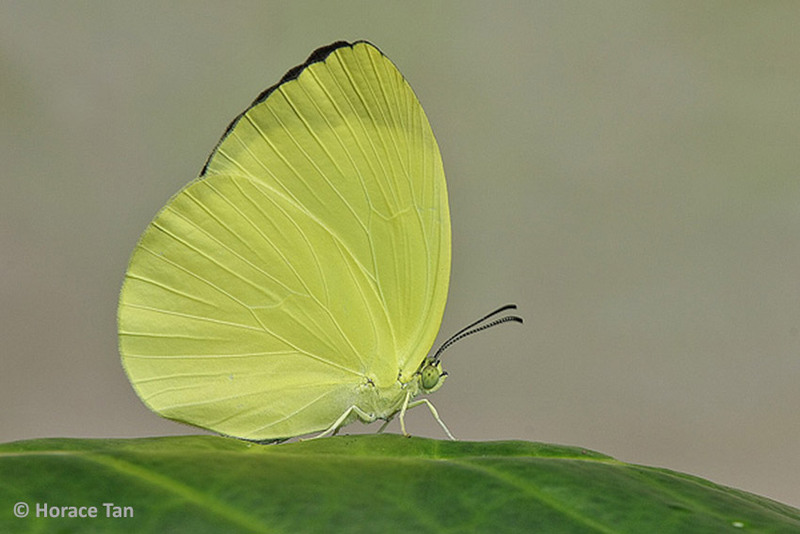 However, the Tree Yellow is much paler, slightly larger and totally unmarked on the undersides of the wings. Except for a narrow black marginal border on the upperside of the forewings, the Tree Yellow is a consistent lemon yellow throughout. Females of the species can be distinguished by a dentate projection in the forewing black border at vein 4, and is generally paler than the males. 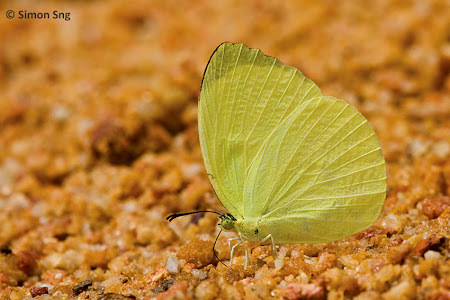 The recorded caterpillar host plants of the Tree Yellow are Monocarpia marginalis and Mitrephora maingayi. Text by Khew SK : Photos by James Chia, Khew SK, Koh CH, Nelson Ong, Simon Sng, Horace Tan and Lemon Tea. Wow. 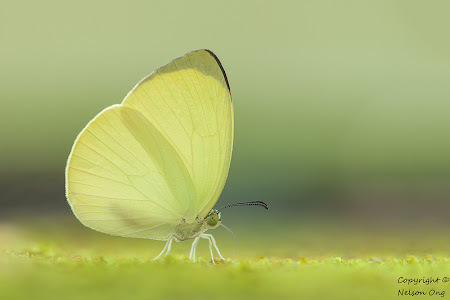 That is a beautiful butterfly. 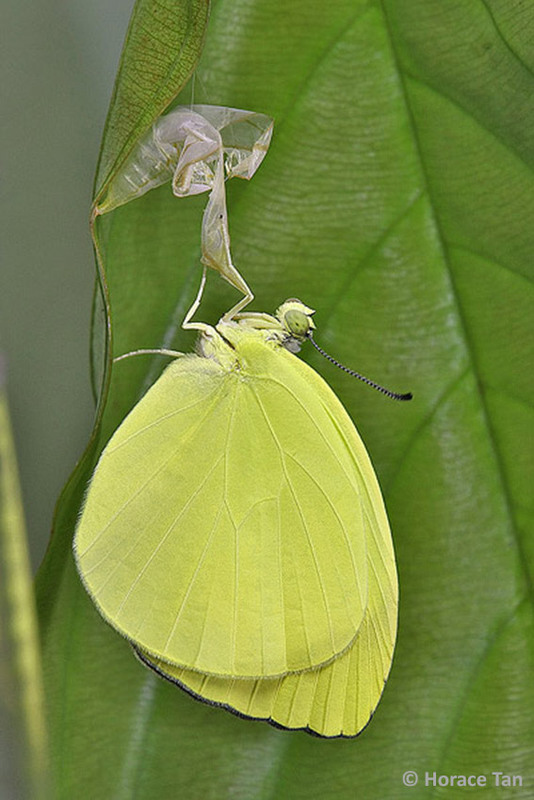 It looks so delicate.